This Persistence Market Research (PMR) report examines the global multiplex detection immunoassay market for the period 2016–2024. The primary objective of the report is to offer insights into developments in the multiplex detection immunoassay market that are effecting the global businesses and enterprises. This report covers the global multiplex detection immunoassay market performance in terms of revenue contribution from various segments. This section also includes Persistence Market Research analysis of key trends, drivers, restraints and opportunities, which are influencing growth of the global multiplex detection immunoassay market. Impact analysis of key growth drivers and restraints are included in this report to better equip clients with crystal clear decision-making insights. The multiplex detection immunoassay market report begins with an overview of the multiplex detection immunoassay and its definitions. This section also underlines factors influencing growth of the multiplex detection immunoassay market along with detailing of the key trends, drivers, restraints, and opportunities. Impact analysis of key regional growth drivers and restraints based on the weighted average model along with key region-specific trends is included in report to better equip clients with information and hidden insights. At the end of the report, PMR has provided key strategic recommendations for both existing and new players in the market to emerge profitable. A detailed analysis has been provided for every segment and sub-segment in terms of market size, Y-o-Y growth rate, absolute $ opportunity, market attractive index and BPS analysis. The next section of the report highlights the growth trends of the multiplex detection immunoassay market by regions. It provides a market outlook for 2015–2024 and sets the forecast within the context of the multiplex detection immunoassay market. The study discusses key regional trends contributing to growth of the multiplex detection immunoassay market worldwide, as well as analyses the extent to which drivers are influencing this market in each region. Key regions assessed in this report include North America, Latin America, Europe, Asia Pacific and MEA. The above sections – by assay type, by technique, by application and by end user and by region – evaluate the present scenario and growth prospects of the multiplex detection immunoassay market for the period 2016 –2024. We have considered 2015 as the base year and provided data for the forecast period. Detailed company profiles include company-specific long-term and short-term strategies, key offerings and recent developments in the multiplex detection immunoassay market. Key competitors covered in terms of manufacturers include Bio-Rad, Thermo Fisher Scientific Inc., EMD Millipore, Microsynh AG., Quansys Bioscience, BD biosciences, QIAGEN N.V, F. Hoffmann-La Roche AG, Unisensor, Luminex Corporation, and Danaher Corporation. To ascertain global multiplex detection immunoassay market size, we have also considered revenue generated by major manufacturers. The forecast presented here assesses the total revenue by value across the global multiplex detection immunoassay market. The forecast presented in the report evaluates the total revenue that is expected to be generated across the global multiplex detection immunoassay market over forecast period (2016–2024). When developing the market forecast, the starting point involves sizing up the current market, which forms the basis for forecasting how the market is anticipated to take shape during the forecast period. Given the characteristics of the market, Persistence Market Research has triangulated the data on the basis of various analysis based on both supply side and demand side. A detailed analysis has been provided for every segment in terms of market size analysis for the global multiplex detection immunoassay market. It is vital to note that in an ever-fluctuating global economy, we not only conduct forecast in terms of CAGR, but also analyze the same on the basis of key parameters such as, year-on-year (Y-o-Y) growth to understand the predictability of the market and to identify the right opportunities for market players. Another key features of this report is the analysis of all segments in terms of absolute dollar. This is usually overlooked while forecasting the market. However, absolute dollar opportunity is critical in assessing the level of opportunity that a provider can look to achieve, as well as identify potential resources from a sales and delivery perspective in the global multiplex detection immunoassay market. In addition to this, we have also provided list of key market players in the global multiplex detection immunoassay market report. 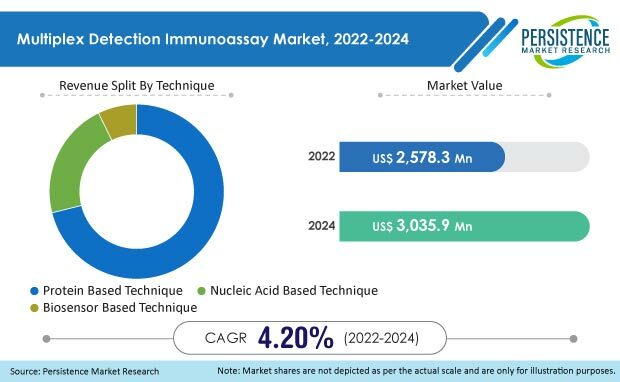 From the extensive primary and secondary research, Persistence Market Research analysts found that the global multiplex detection immunoassay market is a highly fragmented one and hence they focused on the top 12 companies to study the latest trends in this market. Accordingly, the analysts found that there are a number of strategic acquisitions by key market players in order to strengthen their hold in the market. In addition, leading players in the multiplex detection immunoassay market such as Bio Rad, EMD Millipore, Thermo Fisher Scientific are employing synergistic approaches for research and development as well as for distribution of multiplex detection assays. Also, Persistence Market Research analysts have discovered a new trend of replacement of conventional non-magnetic beads with magnetic bed-based assays that offer several distinct advantages. Multiplex immunoassay development is ascribed to the expanding requirement for enhanced disease analytic procedures alongside the diminished costs and minimized errors. Multiplex immunoassays are a promising development, with the possibility to give quantitative information through parallel examinations. These examinations likewise require generously less specimens and reagents than the customary ELISA (which is further constrained by its capacity to quantify only a single antigen). These tests are broadly utilized as a part of the field of clinical and care diagnostic; genomics; drug advancement and quality testing; and different research center examinations. In research facility demonstrative application, multiplex immunoassay is aptly fitting in invulnerable framework issue testing. Promote is generally utilized as a part of practical genomics for the identification of proteins and mRNAs inside the organic specimens and treatment discovery of DNA change. As per the utilization of multiplex immunoassay, the immune-analysis is categorized into two types, planar immunoassay and bead based immunoassay. The global multiplex detection immunoassay market , estimated to be worth US$ 1.5 Bn in 2015, is expected to exhibit a CAGR of 7.5% through 2024. North America is the largest market accounting for US$ 750.7 Mn in 2015, and is expected to register a CAGR of 8.2%. Growth of the global multiplex detection immunoassay market is expected to rise due to expanding geriatric population inclined to immune system sickness and commonness of chronic infections. The capacity of multiplex assay to produce reportable outcomes from one specimen prompts to its more prominent appropriation for clinical or purpose of care diagnostics. In addition, expanding geriatric populace inclined to immune system infection and expanding pervasiveness of perpetual illnesses would add to overall market growth. Due to a robust healthcare infrastructure and expanding government expenditure in clinical diagnostics and medication improvement, the market is set to witness positive developments during the forecast period. Other prominent growth drivers include rapidly growing medical technologies and cost-effectiveness of the treatment in Asia-Pacific and Latin America regions. However, stringent administrative endorsements and lacking reimbursement policies may confine the market development. Improvement of multiplexed immunoassays requires thorough approval of assay configuration and systematic execution to minimize test imprecision and inaccuracy. Challenges connected with multiplex setup incorporate determination and immobilization of capture ligands, alignment, impedance amongst antibodies and proteins. Due to economic issues in some countries for new technology adoption, the overall growth of the multiplex detection immunoassay market over the forecast period may be restricted. The market is segmented based on assay type, technique, application, and end users. On the basis of assay type, the market has been segmented into planar assays and bead based assays. By technique, the protein based techniques is expected to remain the largest segment, registering a CAGR of 8.2% in terms of value, over the forecast period. Introduction of bead-based protein assays is attributed to increasing share of multiplex immune-detection techniques. Advent of multiplexing in proteomics for functional elucidation of new protein targets would further facilitate the extension of protein based technique. Some key players in the global multiplex detection immunoassay market identified are Bio-Rad, Thermo Fisher Scientific Inc., EMD Millipore, Microsynh AG., Quansys Bioscience, BD biosciences, QIAGEN N.V, F. Hoffmann-La Roche AG, Unisensor, Luminex Corporation, and Danaher Corporation. The report also identifies company-specific strategies related to product development, market consolidation initiatives and analysis of their specific strengths, weaknesses, opportunities and threats.